Got an E-mail from a Richard Neal, who has recently released some products for pilots involving Google Earth. He has scanned current pilot Sectional and TAC charts and created visualizations for Google Earth. His web site is called ChartGeek.com, and he is selling a single sectional at 99 cents a chart, or you can buy a DVD with all the sectionals for about $90. 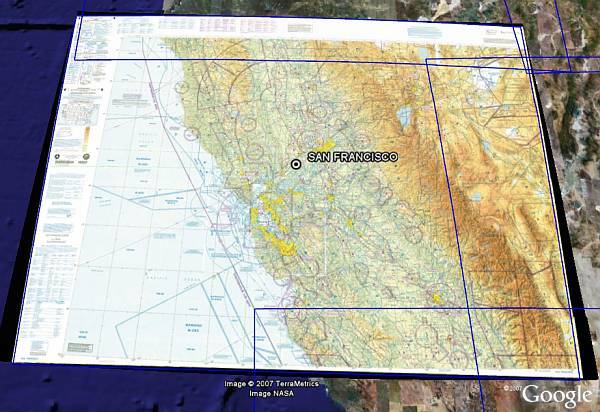 You can download a free demo file which includes a section for San Francisco - the file is 64 Mbytes. The charts are scanned at high resolution and he has used KML 2.1 regioning features so you can see the full resolution as you zoom in for a closer look. The idea is that you can get better situational awareness by viewing standard charts which have been overlayed into Google Earth. You can adjust the transparency (or turn off the layer) to compare the satellite / aerial photos of Google Earth to the charts to help better familiarize yourself with the terrain and landmarks. You can also use Google Earth to bring in other tools like NOAA weather data (radar, clouds, etc.) to enhance your weather familiarity. And, of course, GE is great for looking for things like hotels, dining, etc. to help plan your visit. Richard has some tips on GE's other planning possibilities on his site. Over a year ago, there were scanned sectionals available (just not current ones) for Google Earth. But, that link no longer works. If you're willing to spend 99 cents a chart, this is a handy way to do some planning before you go on a VFR flight - at least in the US. I suspect the charts have not been perfectly orthorectified, but sectionals are not very high resolution. I would still recommend you have the paper chart with you on any flight. I haven't seen the TAC charts he's described yet, but he's sending me a demo DVD which I'll check out soon. That's a really slick idea and product! Good on Richard!